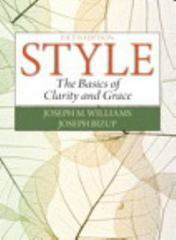 Style 5 Edition Style: The Basics of Clarity and Grace reflectsthe wisdom and clear authorial voice of Williams’ best-selling book, Style: Lessons in Clarity and Grace, while streamlining every chapter to create a very brief, yet powerfully direct guide to writing with style. The concise clarity of this book makes it a handy reference for anyone interested in good writing--as well as a quick and ideal guide for freshman composition courses, writing courses across the disciplines, and as a supporting text in courses that require clear and direct writing. Style: The Basics covers the elemental principles of writing that will help students diagnose the strengths and weaknesses of their prose quickly and revise effectively. The text features principles of effective prose written in Williams’ hallmark conversational style, offering reason-based principles, rather than hard and fast rules, for successful, effective writing.